Book Tag: Reader Problems – It's Lily O. People who review the book and feel the same way I do on Goodreads and Amazon. Otherwise, I keep my less than positive opinions to myself. Trying to figure out how many series I am currently reading. It is a constant struggle for me to keep up with the numerous series I follow. When another book in a series is coming out, I reread the first chapter and the last chapter of the book. “Sorry, I only have that as an ebook” or “I don’t loan out my books”. 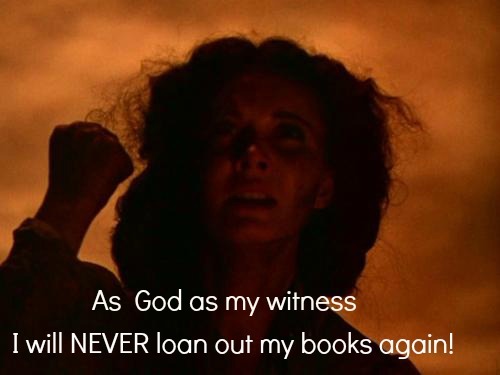 When I was younger I was afraid to say “no” to people who wished to borrow my books. However, that changed when I loaned out one of my favorite books, never to see it again. Read my favorite part of one of my favorite books. It reminds me of why I enjoy reading and I normally find my way back to reading again shortly after. 10. There are so many new books coming out that you’re dying to read! How many do you actually buy. This may or may not be footage of what occurs when I am within six feet of a bookstore. spend a fair amount of money on. I am ashamed to say how much I spent on Amazon last year. If I was anticipating its release, the minute after my preorder payment email comes through. If it is a book that I bought on a whim, it can sit on my shelf for months. For example, I had Nia Forrester’s book Afterwards on my shelf for eleven months before I recently read it.